Wild: Among the largest creatures I’ve seen on the island, Brontosaurus Lazarus is larger than any sauropod I’ve read about. In fact, the dinosaur is so massive that it ignores most other creatures. Domesticated: Because of how docile it is, Brontosaurus makes the ideal pack-animal. Peaceful tribes use it to carry incredible quantities of resources, while warring tribes use it to mobilize their army. 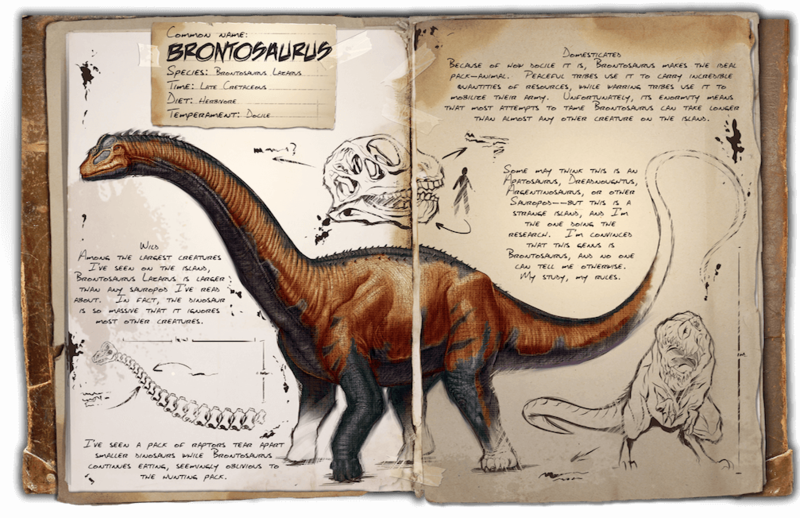 Unfortunately, its enormity means that most attempts to tame Brontosaurs can take longer than almost any other creature on the island. Known Information: I’ve seen a pack of Raptors tear apart smaller Dinosaurs while Brontosaurus continues eating, seemingly oblivious to the hunting pack. The Brontosaurus is extremely protective of its eggs and will attack if provoked. However, some may think this is an Apatosaurus, Dreadnoughtus, Argentinosaurus, or other sauropod – but this is a strange island and I’m the one doing the research. I’m convinced that this genus is Brontosaurus and no one can tell me otherwise. My study, my rules.